The morning was mostly cloudy with a light breeze. Western Tanager up high on a snag. Red Crossbill, Purple Finch, Pine Siskin. Estuary, in Parksville. The morning was sunny and the winds were calm. Monday. June 28th –7:30 p.m.
Speaker: Hans Boerger will share his knowledge on pond life. This will be the last Tuesday Birdwalk until September 7, 2010. 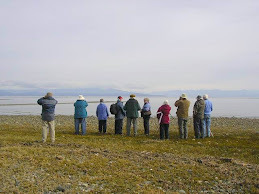 The Tuesday bird walk went to Plummer Road side of the Englishman River Estuary, in Parksville. The morning was sunny and the winds were calm. The highlight of the morning included seeing a Whimbrel landing in front of us on the beach at the end of Mariner Way, giving us a great view. A pair of Spotted Sandpipers were moving together in and out of the grass near the viewing stand. The Sunday Bird Walk today was cancelled due to illness, but eight dedicated birders did a self guided walk to the Beaver Ponds in Fairwinds. Thanks to you all for your understanding! Violet-green Swallows, Tree Swallows, Barn Swallows and Northern Rough-winged Swallows were seen hawking insects at Rivers Edge behind the Government Weigh Scale in Parksville. High above the Swallows, three Common Nighthawks were spotted. 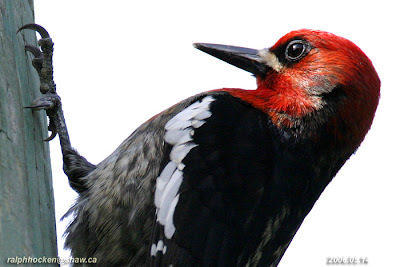 A Red-breasted Sapsucker was seen on a tree at the forest edge. The evening was full of the sounds of White Crowned Sparrows and Chipping Sparrows, with the occasional croak of a Bull Frog! The Tuesday bird walk went to Lot Ten along the Little Qualicum River in Qualicum Beach. The morning was cloudy with a light breeze, but no rain fell during the morning. We spotted a Peregrine Falcon flying above us as we started out from the Parksville Community Park. There was a Great Blue Heron perched on a rock at Qualicum Beach just past the tide line. We heard and then saw a Red-breasted Sapsucker tapping on a tall snag at the start of the walk on Lot Ten. We had great long looks at a Black-throated Gray Warbler perched in a tall snag at the edge of the forest. 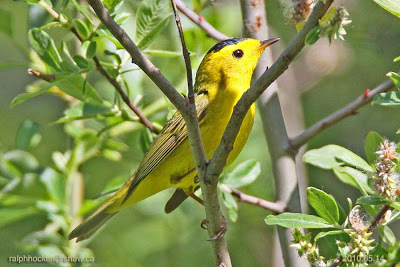 An Orange-crowned Warbler flew into the forest edge. As we walked towards the river we heard and then spotted a Red-eyed Vireo gleaning insects, high up in a Big Leaf Maple tree above us. We saw and heard many Swainson's Thrush throughout the morning and we watched a Swainson's Thrush having a bath along the rivers edge. A family of Belted Kingfishers were resting along the rivers edge. A fledging Red-breasted Sapsucker was sitting on the hydro lines above our cars at the end of the walk. Black-headed Grosbeak, Purple Finch and American Goldfinch. A Western Wood-pewee and a Willow Flycatcher was seen in the wild rose patch, on the Shelly Road side of the Englishman River Estuary in Parksville. A pair of Yellow-headed Blackbirds were seen at the Nanoose Estuary in Nanoose Bay. Three Osprey were observed flying overhead near the 3km mark Westwood Lake in Nanaimo. A Black-headed Grosbeak was seen along Roxanne Drive in Nanaimo. A Mountain Bluebird was seen at the end of Gerald Street in Nanoose Bay. Great Horned Owl fledglings were seen near Northfield Road and Highway 19, in Nanaimo. Arrowsmith Naturalist meeting, Monday. June 28th –7:30 p.m. Guest Speaker: Hans Boerger: Close Encounters with Pond Critters. playground at 9 A.M. or at the corner of Plummer Road and Shorewood Drive at about 9:15 A.M. The Sunday Bird Walk on June 27, 2010 will be going to Springwood Park in Parksville. 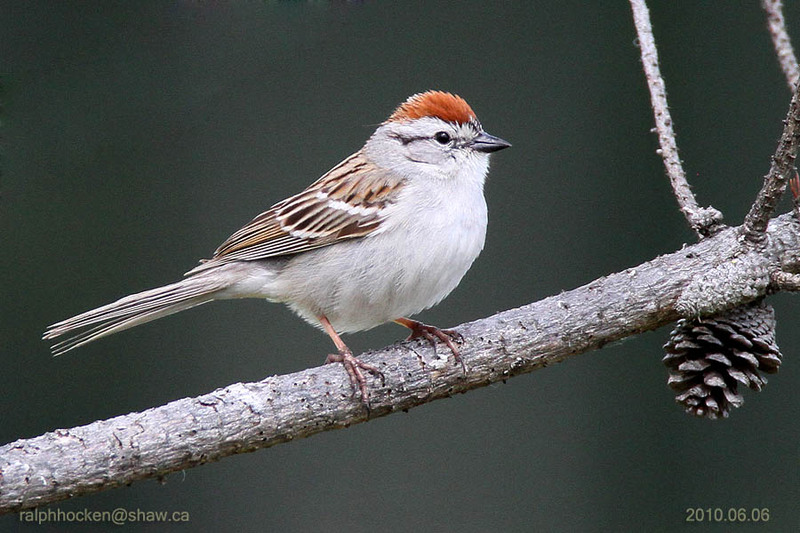 We will meet at The Backyard Bird Store at 9:00 A.M. or at the west end of Despard Avenue at about 9:30 A.M.
Red-breasted Sapsuaker: Ralph Hocken Photo. It is with great sadness that we want to let you know that Jack Lasure passed away on May 30, 2010. We will miss Jack on the Tuesday bird walks . The Sunday Bird Walk went to the Linley Valley in Nanaimo. The morning was partly cloudy with a light breeze. At the start of the walk we heard an Olive-sided Flycatcher and we then spotted him high up in the top of a tall snag. We saw several Western Tanagers through out the morning. Canada Geese, Hooded Merganser, Mallard, Turkey Vulture, Bald Eagle, Rufous Hummingbird, Downy Woodpecker, Northern Flicker, Pileated Woodpecker, Pacific-slope Flycatcher, Willow Flycatcher, Olive-sided Flycatcher, Warbling Vireo, Cassin's Vireo, Common Raven, Northwestern Crow, Violet-green Swallow, Northern Rough-winged Swallow, Chestnut-backed Chickadee, Brown Creeper, Red-breasted Nuthatch, Bewick's Wren, Winter Wren, Swainson's Thrush, American Robin, Cedar Waxwing, Orange-crowned Warbler, Black-throated Gray Warbler, Common Yellow-throat, Wilson's Warbler, Western Tanager, Spotted Towhee, Black-headed Grosbeak, Brewer's Blackbird, Brown-headed Cowbird, Song Sparrow, Purple Finch, Red Crossbills and American Goldfinch. The birdstore has received several reports of Evening Grosbeaks in Nanaimo this week. Two Common Nighthawks were seen over Morrell Circle in Nanaimo. A Black-headed Grosbeak is visiting feeders along Gainsburg Road in Deep Bay. A male Northern Harrier was seen circling low by the road between Rupert Road and Highway 19, along Highway 4 near Qualicum Beach. A Black Headed Grosbeak was seen visiting feeders at the north end of Jingle Pot Road in Nanaimo. A Common Nighthawk was seen over the Northfield Road and Highway 19 at the rest stop in Nanaimo. The morning was mostly sunny and the wind was calm. The forest was filled with the sounds of spring. 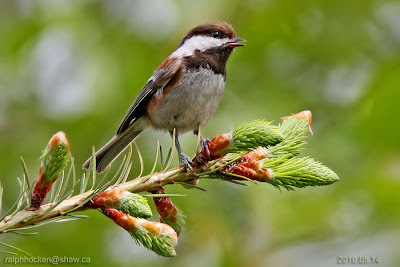 We saw and heard a large number of Chestnut-backed Chickadee families feeding their young throughout the morning. 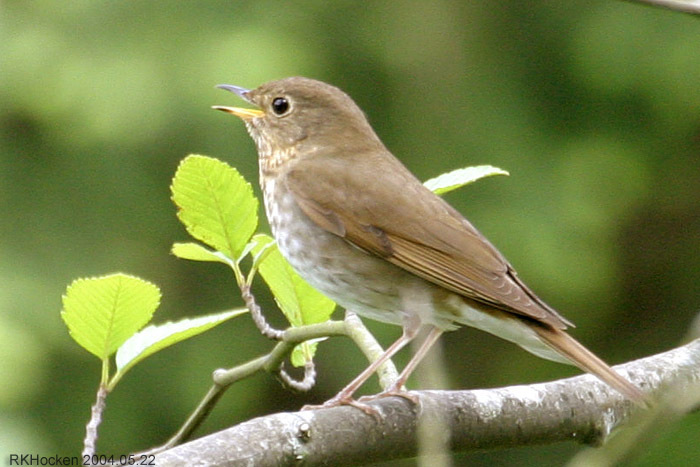 The Willow Flycatchers were perching and singing on the lower bushes near the meadows, giving us good views as they put their heart into their songs. We spotted Savannah Sparrows flycatching from the short snags in the meadows. 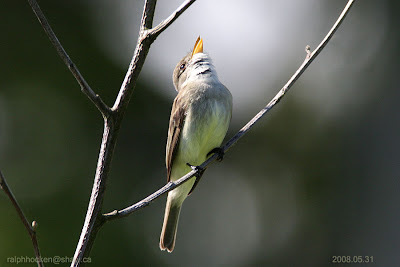 There were Pacific-slope Flycatchers singing from high up in the Fir trees throughout the morning. We watched as a Barred Owl was flushed from it's perch by an American Robin. Red-breasted Nuthatch, Brown Creeper, Bewick's Wren, Winter Wren, Swainson's Thrush, American Robin, European Starling, Cedar Waxwing, Orange-crowned Warbler, Yellow Warbler, Spotted Towhee, Savannah Sparrow, Song Sparrow, White-crowned Sparrow, Black-headed Grosbeak, Red-winged Blackbird,Brewer's Blackbird, Brown-headed Cowbird, Purple Finch, House Finch , Red Crossbill and Pine Siskin. An Evening Grosbeak was seen along Lakeview Crescent in Nanaimo. A male Mountain Bluebird was seen at the Nanaimo River Estuary in south Nanaimo. Two Caspian Terns were seen at the Cottonwood Golf Course in south Nanaimo. A Marbled Murrelet was seen in Stuart Channel just outside of Ladysmith harbour. A Lazuli Bunting was seen again today in the 2600 block of Kevan Drive on Gabriolia Island. A Steller's Jay was seen in the trees along Bay Street in Nanaimo. A Barred Owl was seen in the 800 block of Harewood Mines Road in Nanaimo. A Baird's Sandpiper was seen near the Surfside R.V. site at Parksville Bay. General Meeting---Speaker: Hans Boerger will share his knowledge on pond life. The Tuesday Bird Walk on June 15, 2010 will be going to Lot Ten in Qualicum Beach. playground at 9 A.M. or at the end of Kinkade Road (the mountain side of Highway 19a) at about 9:25 A.M. The Sunday Bird Walk on June 20, 2010 will be going to the Beaver Ponds in Nanoose Bay. 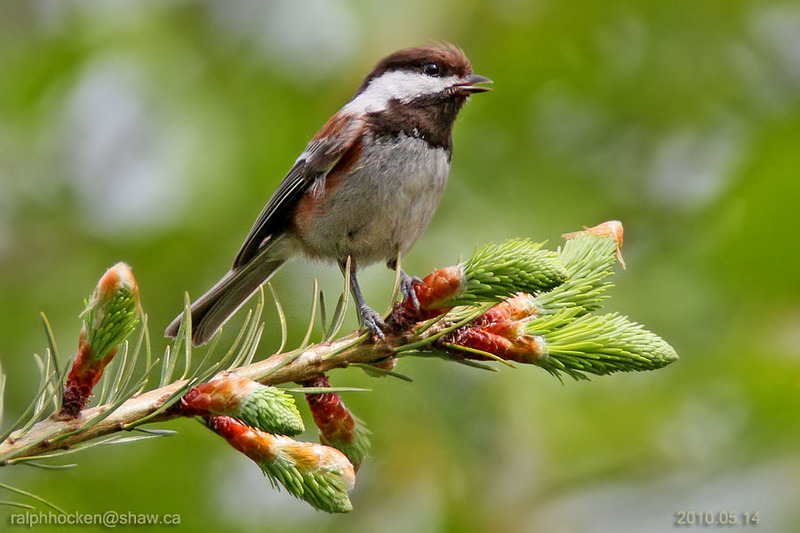 We will meet at The Backyard Bird Store at 9:00 A.M. or at the parking area about 100 feet past the fourway stop on Power Point Road in Nanoose Bay at about 9:20 A.M. It is with great sadness that we want to let you know that Jack Lasure passed away on May 30,2010. We will miss Jack on the Tuesday bird walks . The morning was cloudy with light rain showers throughout the morning. We heard and had great looks at a number of Black-headed Grosbeaks through out the morning. 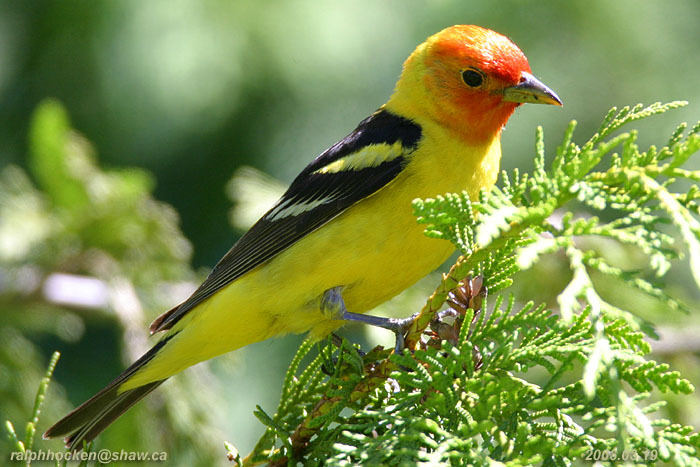 A Western Tanager perched high in a fir tree. 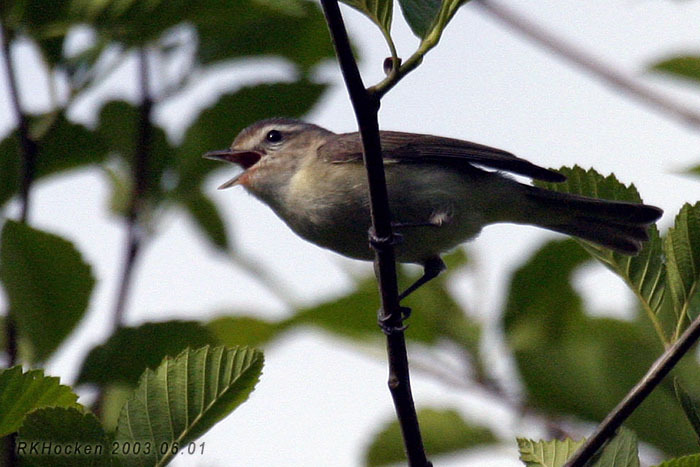 We spotted a Warbling Vireo low in the bushes gleaning insects. A Merlin, hawking Dragonflies over the pond, kept us entertained at the end of the walk . Twenty-one birders saw and heard the following forty-two species of birds. Turkey Vulture, Mallard, Wood Duck, Hooded Merganser, Bald Eagle, Merlin, California Quail, Band-tailed Pigeon, Anna's Hummingbird, Rufous Hummingbird, Northern Flicker, Willow Flycatcher, Pacific-slope Flycatcher, Warbling Vireo, Violet-green Swallow, Northern Rough-winged Swallow, Northwestern Crow, Common Raven, Chestnut-backed Chickadee, Bushtit, Red-breasted Nuthatch, Bewick's Wren, Winter Wren, Brown Creeper, Golden-crowned Kinglet, Swainson's Thrush, American Robin, Cedar Waxwing, Orange-crowned Warbler, MacGillivray's Warbler, Wilson's Warbler, Western Tanager, Black-headed Grosbeak, Brown-headed Cowbird, Brewer's Blackbird, Spotted Towhee, Song Sparrow, Purple Finch, House Finch, Dark-eyed Junco, American Goldfinch, Red Crossbill. A pair of Evening Grosbeaks are visiting feeders in the 100 block of Meridian Way in Parksville. The Tuesday bird walk went to the Top Bridge Trail in Parksville. The morning was cloudy and windy, but there was no rain and we did have a few sunny periods. We had great looks at Willow Flycatchers throughout the morning. A large flock of Bald Eagles and Turkey Vultures soared high over Little Mountain. We watched families of Chestnut-backed Chickadees, Bushtits and Red-breasted Nuthatches feeding their young. 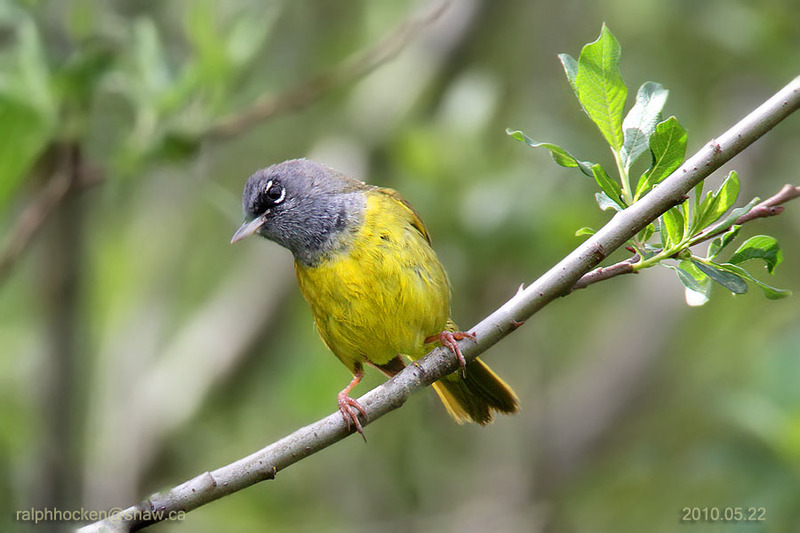 We heard a MacGillivray's Warbler singing close by and then got a good look at him. There was a Black-throated Gray Warbler gleaning insects high up in a Cedar tree. Canada Goose, Turkey Vulture, Bald Eagle, Spotted Sandpiper, Black Swift, Rufous Hummingbird, Northern Flicker, Willow Flycatcher, Pacific-slope Flycatcher, Cassin's Vireo, Warbling Vireo, Northwestern Crow, Common Raven, Violet-green Swallow, Chestnut-backed Chickadee, Bushtit, Red-breasted Nuthatch, Bewick's Wren, Winter Wren, Swainson's Thrush, American Robin, European Starling, Orange-crowned Warbler, Black-throated Gray Warbler, Townsend's Warbler, MacGillivray's Warbler, Wilson's Warbler, Spotted Towhee, Chipping Sparrow, White-crowned Sparrow, Black-headed Grosbeak, Red-winged Blackbird, Purple Finch, Red Crossbill and Pine Siskin. A flock of Band-tailed pigeons was spotted flying and alighting in trees in the Sherwood Forest area just off Hammond Bay Road in Nanaimo. A pair of Lazuli Buntings were seen visiting feeders in the 2600 block of Kevan Drive on Gabriola Island. Cedar Waxwings, a female Rufous Hummingbird picking fluff off cattails, a Western Tanager and two Red-breasted Sapsuckers hawking insects were seen at Westwood Lake in Nanaimo. Four pairs of Band Tailed Pigeon's, Evening Grosbeak's, Purple Finch, American Goldfinch, Song Sparrows, Pine Siskin's, Spotted Towhee's and Red-breasted Nuthatches were visiting a backyard behind the Red Gap Center at Nanoose Bay. The Tuesday Bird Walk on June 08, 2010 will be going to the Shelly Road side of the Englishman River Estuary in Parksville. playground at 9 A.M. or at the oceanside end of Shelly Road in Parksville at about 9:20 A.M. The Sunday Bird Walk on June 13, 2010 will be going to Linley Valley in Nanaimo. We will meet at The Backyard Bird Store at 9:00 A.M. or at the end of Burma Road, off Lost Lake Road at about 9:20 A.M.